These are a few of the seeds I saved from last year. I didnt get very many because we moved in the middle of garden season. My goal is to work towards seed self sufficiency, being able to plant all my own seed from year to year without being dependent on buying them. In order to do that, I must plant heirloom and open pollinated varieties. Open pollinated means that the plants can freely pollinate each other and will produce seed that is like the original, or parent plant. They are not a specific cross. Many of the varìeties today are hybrids, bred to have special characteristics, increased yield, resistance to disease, etc. They are great plants, but if I keep the seed from one of these, there is no guarantee that the next generation will resemble the parent plant. 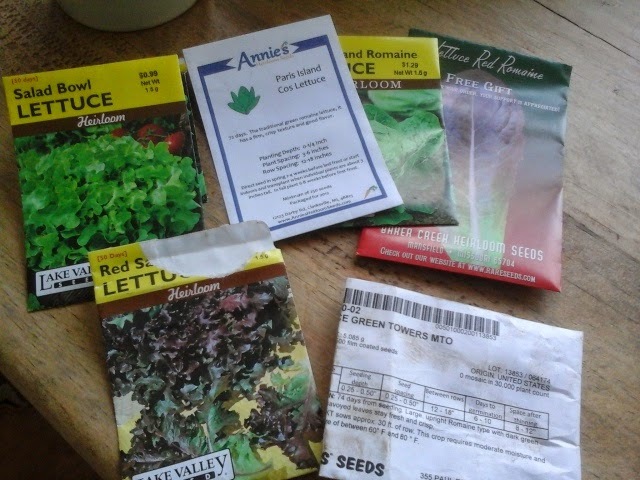 So, While i am slowly increasing my store of saved seeds, I am only planting these open pollinated varieties. Heirloom plants are open pollinated and will breed true. All these lettuces are heirloom, except the bottom right package. It was a freebie from the seed company. I planted some last year and was not impressed. 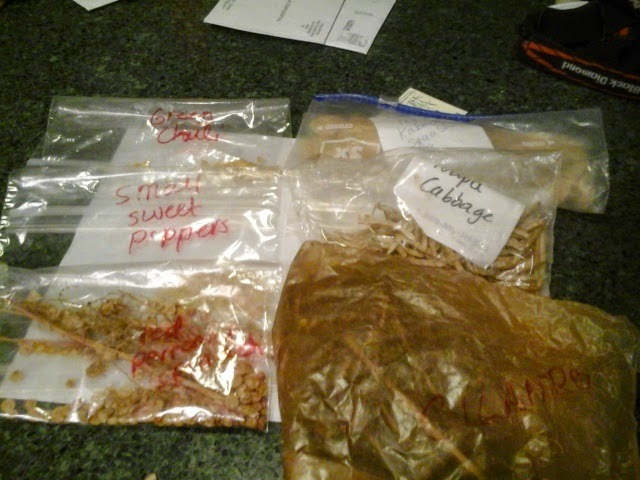 Some seeds are easier to save than others. And some, like carrots, are biennials, producing seed every other year. There is a bit of a learning curve, so I am doing what I can now to figure this all out, while I can still fall back on purchasing seeds if necessary. I dont know yet exactly what percentage of any crop needs to be reserved just for seed propagation. Weather : cold, and clear. About 8 this morning. Wildlife: While driving by the river, I saw a lone mallard duck hen swimming. She should not be here! I am worried about her. Training: today is upper body strength training. I still have trouble with my shoulders after an auto accident a few years ago. It irks me, but I have to go really slow with building up reps. Sow your seed in the morning, and in the evening let not your hands be idle. For you do not know which will be succeed, this or that, or whether both will do equally well."